When you are young hearing about how your choices have consequences is redundant - it's boring, it's an obnoxious lecture, it's routine whenever you get in trouble. You've heard it all: teachers and principals are constantly reminding you to be on your best behavior, your spiritual leader says God will guide you on a righteous path as long as you believe, your parents lecture you about how you must make the right choices so that your life turns out perfectly, yadda yadda yadda - you get it, right? You're a professional at life and although your parents are just trying to be helpful, you know everything you need to know about life and you'll do what you want. I get it. I totally do. I'm not here to lecture anyone. I'm sharing this as an informal letter to my younger self - a letter to my former self. "Please take the time everyday to stop and look around, enjoy every second of your life. Stop rushing to grow up. I know you only want to grow up because you are assuming life will be better when you're older. I've got news for ya kid, it gets tougher. The grass is hardly ever greener, in any situation. Stop feeling like the world is on your shoulders and that your life is so hard because in all reality - your suburban, middle class upbringing is no excuse for your behavior - bad decisions reflect on you and you alone when all is said and done, remember this. What kind of reputation would you prefer to have? Think about this before you decide to get involved with the wrong crowd. Sadly, you will put yourself in bad situations. You will get hurt. You will occasionally even be ashamed of your choices. You could have avoided all of this, but you are young, you know everything." 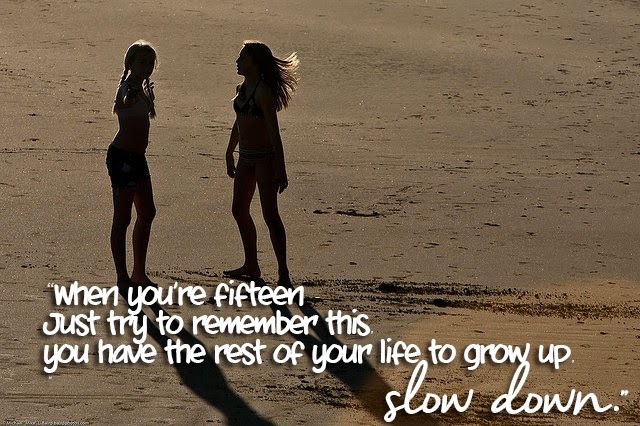 When you're fifteen - Just try to remember this, you have the rest of your life to grow up, slow down. This post is part of a writing challenge I'm participating in during the month of August, are you interested in joining? Link up with BE society.